Do you draw when taking notes? Do you like to do your planning visually? There are lots of different ways to organize your ideas. Having a reliable system really speeds up the process. In this post you’ll learn about one of my favorites. Some people make lists, others write, some doodle. If you’re fall somewhat into the doodler category, this one is for you. One of my favorite ways to plan a business project, article, or personal activity is by making a mind map. It looks kind of like a spider web or a family tree. Start with a central topic and then draw branches leading to sub topics. And then each of those can lead to other ideas. You can plan out a book by putting your title in the center, then drawing branches to each of the subjects you want to cover. Then each of those can lead to more specific points. You can get as detailed as you’d like! The hierarchy of ideas makes it easy to organize your thoughts, and also know what they mean when you come back to it later. You can very easily plan with pencil and paper. I’m a fan of drawing them on a big whiteboard. 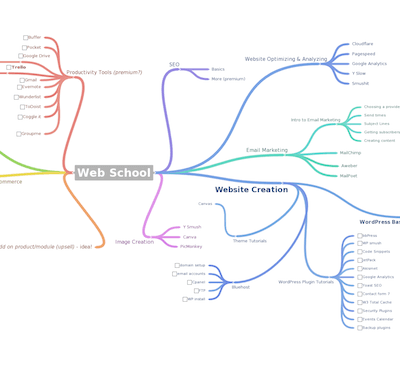 Making a mind map is great for planning, but once you’ve drawn one, you may need to come back to it later. A piece of paper can get lost and makes it difficult to share your ideas with others. Sometimes I end up drawing a mind map and taking a picture to save into Evernote, but that has its limits too. My favorite tool for making and sharing mind maps is Coggle. It’s very simple to use, lets me share and collaborate with others, and it’s free. 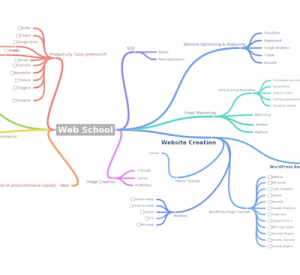 If you search the web for mind map tools, you’ll get a lot of results. It’s a fairly popular planning tool, and there are tons of web and software solutions out there. I know of several programs that are for mind map power users who want to make large, detailed, and complex mind maps. But it’s also a great way to overwhelm yourself with features instead of planning whatever project you’re working on. Which is why I use Coggle. It’s simple. Give it a try, let me know what you think! I have so many ideas that it’s really helpful to have an easy to access visual storage of how they all fit together. What upcoming projects do you have that could use a mind map for planning? Do you have any other organization challenges? Leave a comment below.